Mathematicians formula adds perfect cream tea A real mathematician has come up with a formula for the perfect cream tea (and let's not get into the Cornish verses Devon argument!). Not only is there the fancy graphic, but there is a paper. There is some impressive (if you are in Year 7) mathematics for the thickness of the jam and the cream, and the news media just laps it up. In his fantastic book (READ IT! ), Bad Science, Ben Goldacre bemoans these studies that regularly appear in the media, studies like the most miserable day of the year, or most perfect bottom, for a number of reasons. There has been quite a buzz this week about a man called Weinstein. Oh, for crying out loud - that's Ninestein, from Terrahawks. But with a name that sounds a bit like Einstein, he must be smart! So, what's the buzz? It all started with an article in The Guardian - well, I say article, but the correct name is puff piece. It's a strange read, but is authored by well known mathematician, Marcus du Sautoy. I have a lot of respect for du Sautoy, firstly as he is the Simonyi Professor for the Public Understanding of Science, and for several of the TV shows he has presented, including the wonderful The Story of Maths. But this article left me scratching my head. 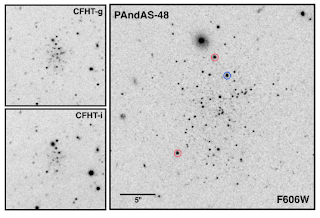 The Pan-Andromeda Survey (PAndAS) continues to be a gold-mine for science. We're squeezing it hard to get out key results, but next year, the data will become public and everyone can have a looksie and write their own paper. Here we have another paper by ANU astronomer, Dougal Mackey. Dougal's expertise is understanding the globular clusters orbiting the Andromeda galaxy, especially the distant clusters. He published a really nice piece of work recently which showed that these distant globulars are not just scattered randomly about Andromeda, but are more likely to be sitting on the stellar substructure we see. This substructure is the tidal debris from smaller galaxies that have fallen in and been shredded, meaning that the globulars are immigrants, having been born outside Andromeda, but joining the halo when their parent galaxy is destroyed; this is galactic cannibalism in action. I've lived in Australia for thirteen years, but in the way that Sting was an English Man in New York, I have never quite felt "Australian", rather, I am a Welsh Man in Sydney. Anyway, I still feel very British, and am a fan of British TV (apart from a few highlights, Australian TV is generally bilge). Anyway, I've always loved a good murder mystery, and I like Midsomer Murders, even though they have changed the lead character (and the new chief inspector was actually a criminal in a previous episode). The premise of Midsomer's is simple; a cop in the quite fictional county of Midsomer solves murders. However, the show has been running for 15 years, and there seems to have been an awful lot of murders (although the murder rate is considerably lower than Honduras!). To keep the stories going, murders are set in, quite often, bizzarre circumstances. Becoming a science professor sorta snuck up on me. Not getting the title, as that happened at a distinct point in time (namely the first of January 2009), but the 'separation' from being a student and then postdoctoral researcher grows somewhat slowly. A colleague of mine recently expressed surprise when he discovered his students were somewhat daunted when speaking with him (this is partly as there is the perennial fear of "looking stupid" that students have), and I'm pretty sure my fellow faculty member does not feel that different to the students he talks to. Just a little bit of Bad Physics, this time from the L. A. Times. The story was "Mysterious hydrogen clouds detected in space, puzzling scientists", a nice story. "The clouds don't emit light or energy, but the neutral atomic hydrogen that they are made of gives off a distinct radio signal that astronomers were able to pick up using the National Science Foundation's Green Bank Telescope which measures radio waves." Apparently, these clouds do not emit light or energy, but they do emit radio waves that we can detect with out telescopes. Aghhh!! where λ is the wavelength of the radiation. Real warp drives – can distributed computing help? However, I will say that this is the last round of Future Fellowships, removing the opportunity for mid-career researchers to focus on, well, research. This will leave a hole in research efforts in Australia.